When the Messenger of Allah, peace and blessings be upon him, migrated to Medina, he found that its people celebrated on two days. He asked about the two days. They told him that they were festivals that they celebrated during the days of ignorance. So he told them: "Indeed Allah has substituted them for you with two better days: the day of Adha (sacrafice) and the day of Fitr (breaking the fast)." Sahih Abu Dawud, #1039. For many years the Bakersfield Muslim Community has joined together to perform both Eid prayers at a single location. God willing, we will continue this tradition for many years into the future. 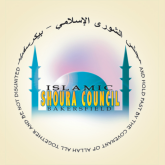 Following the Eid prayers, the Shoura Council usually provides coffee, tea, donuts or other treats. Jazakum Allahu Khairun ajma'iin. May Allah accept all of our efforts in this blessed month and keep us united striving all together in His Cause as One Ummah, undivided, Allahumma Amin.